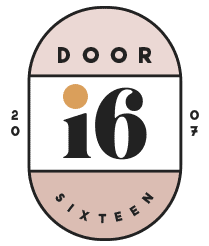 Door Sixteen accepts a very limited number of sponsored posts, product giveaways, banner/sidebar ads, and other types of brand collaborations—including cross-promotion on social media. Only brands and products that reflect Anna’s tastes and the interests of Door Sixteen readers are considered for inclusion. Thousands of people read Door Sixteen every day—why not take advantage of that visibility for your brand? A veteran blogger of 21 years, graphic designer Anna Dorfman started Door Sixteen in 2007 to document the never-ending renovation of her 1890s Victorian row house in New York’s Hudson Valley—and later, a series of rented pied-à-terres in Manhattan and Brooklyn. Since then, Door Sixteen has expanded to include Anna’s current home (a 1950 Pueblo revival bungalow in Santa Fe, New Mexico), interior and graphic design, DIY tutorials, food, cosmetics, family, dogs (Anna’s Chihuahua, Fritz is along for the ride! ), art, coffee, music, books, politics, and the endless struggle to find life/work balance. With a large and loyal group of readers that continues to grow, she has long established herself as an honest, trusted voice within the design and lifestyle blogging community. Door Sixteen has appeared in publications including Dwell magazine, the Washington Post weekend magazine, Glo/MSN, Lonny, Grazia, Glamour and Elle Decor, and is frequently featured on prominent home design blogs like Apartment Therapy, Remodelista, Design Milk, Refinery29, SFGirlByBay, A Beautiful Mess, Young House Love, The Kitchn, and Herman Miller Lifework. Anna has served as a Brand Ambassadör for IKEA, was chosen for Say Media’s Say:100, a list of 100 voices shape opinion, and is a prolific Instagrammer. *Traffic figures—based on averages of stats from StatCounter, Google Analytics and WordPress Stats—are currently outdated following an extended break from blogging. Please note that these numbers will be updated after I’ve been back in the swing of things for a while! Please feel free to contact me at anna@doorsixteen.com if you have any questions at all, if you’d like a copy of my media kit, or if you’re interested in discussing sponsorship options. Please note that I do NOT accept text link ads or guest-written posts. 100% of the content on Door Sixteen is written by me, Anna Dorfman, and all posts reflect my own views and opinions.